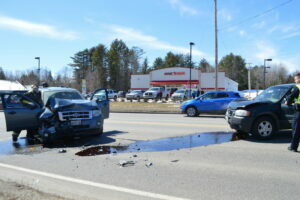 FARMINGTON — Three people were injured Thursday afternoon when two SUVs collided on Routes 2 and 4, in front of Farmington Tire Center and Family Dollar. The accident happened when Marion Rollins, 90, of Farmington attempted to turn left into the tire center, but failed to yield to an SUV driven by Marcel Shink, 81, of Jay, according to Sgt. Edward Hastings IV of the Farmington Police Department. Rollins, Shink and Shink’s wife, Maurie Shink, 76, who was a passenger in their SUV, were taken to Franklin Memorial Hospital by NorthStar EMS ambulances. 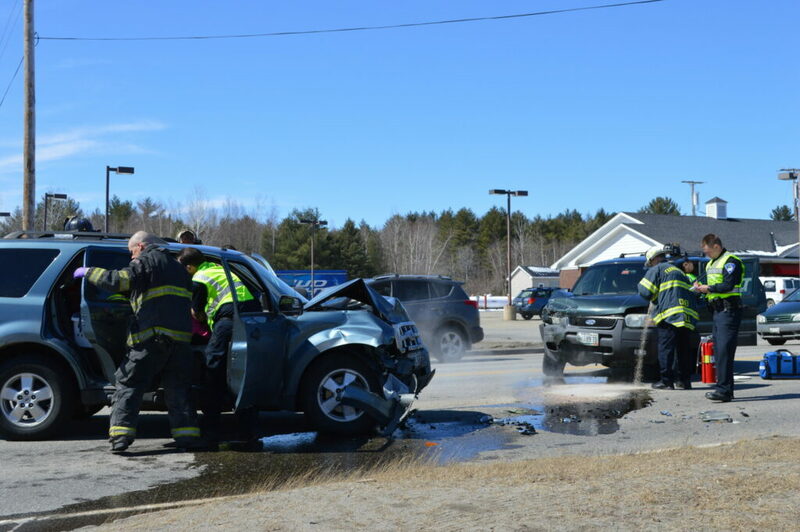 Farmington firefighters conducted traffic control, cleaned up fluids that had spilled from the vehicles and checked on the occupants until the ambulances arrived. Traffic was backed up while the four-lane highway, known as the Wilton Road, was reduced to one lane. Both SUVs were towed from the scene.